Video signal level is indicated by IRE with the normal range from 0% to 100%. However, even a small deviation from the normal range will cause the video signal clipped due to inexistence of the supported code, which sometimes causes troubles in actual operations. Therefore, signal allocation is being performed in the range that includes marginal parts called “super white” and “sub black”, and thus, IRE range is approximately - 7% to + 109%. To restrict the IRE range to 0% - 100% at final output after editing and other works have been completed, [Color Balance] in [Color Correction] can be used. Checking [Safe Color] in the [Color Balance] dialog box restricts each signal of YCbCr so that its IRE range is to be within the range 0% - 100%. After automatic adjustment by [Safe Color] has been performed, some part may not be within the 0% - 100% range in the RGB waveform of [Videoscope]. This occurs after conversion of YCbCr signals restricted within 0% - 100% range into RGB signals, in which some parts are out of the 0% - 100% range of RGB signal. Unless a codec that outputs RGB signals, such as uncompressed RGB, is used as the output format, output will be performed in YCbCr signals which has the range 0% - 100%. If you need to maintain the 0% - 100% range also when data of RGB signals is displayed, adjustment can be performed using primary color correction. 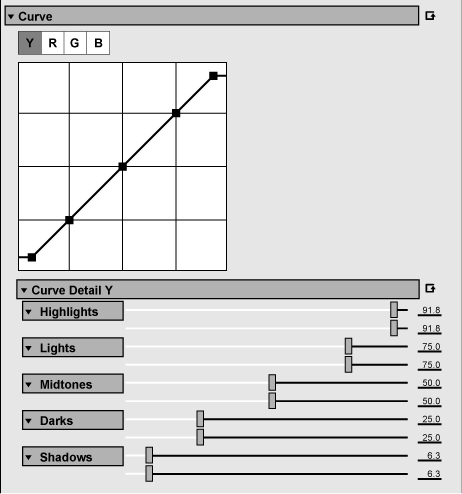 Use [Curve] in the primary color correction and set as in the figure below, to make RGB signals within the 0% - 100% range. If RGB signals are restricted within the range 0% - 100%, YCbCr signals will also be within the range 0% - 100%, which does not require adjustment by [Safe Color] of [Color Balance]. The setting values for [Highlights] and [Shadows] correspond to IRE 100% and 0% respectively. Since [Lights], [Midtones], and [Darks] are not affected by the signal level restrictions, their parameters can be modified to adjust the tone.